First World war. 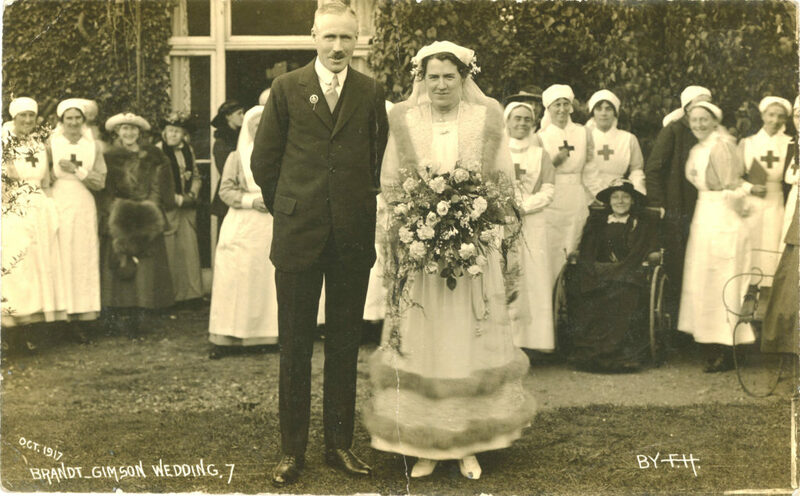 ‘Brandt Gimson wedding, Witham, Oct.1917’. Wedding of Mary Gimson and Hugh Brandt. Mr Brandt ‘appears to be wearing a silver War Badge, a silver lapel badge issued to servicemen invalided out of the service for wear to show that they had ‘done their bit’ (quoting Ian Hook, Essex Regiment Museum). See a long report in the Essex County Chronicle, 12 October 1917. Mary was sister of Drs Ted and Karl Gimson (for which e.g. see photos M102 and M126). This shows the group at the reception with the couple in the middle. The group behind includes VAD. nurses who worked at the Red Cross Hospital, where Mary was commandant. The four women facing the camera on the left are, left to right, Miss Eva Croxall (VAD, daughter of James Croxall, manager of Witham Gas works, afterwards Mrs Hayes), Mrs Nancy Mann (VAD, lived in Mill Lane, husband had a school at 124 Newland Street), Mrs Sybil Sherwood (of Kelvedon, showed race horses), Miss Kathleen Blood, (daughter of solicitor). Immediately to right of the bride is possibly May West (VAD). Behind the wheelchair is Adeline Pearce (VAD, daughter of Vaughan Pearce, churchwarden, lived at Littlefields, 41 Chipping Hill). In the wheelchair is Miss Ella Pattisson (sister of Alice, both lived at Pelican Cottage, 16 Collingwood Road). Facing the camera extreme right, left to right, are Kitty Round (VAD, of Avenue House, 4 Newland Street), and Gertie Luard (a daughter of Admiral Sir William Luard of Witham Lodge). The location is probably the garden of The Gables, 127 Newland Street; the reception was at the home of Mrs Gimson (bride’s mother) who lived at The Gables according to the directories. Another copy is photo M 118. See also photos M187 M188, M189, M190. The Surgery is now number 129, and the Brandt’s house was probably 125 or 125-27, the Gables.